The effect of herbivory and nutrient enrichment on the growth of invasive and native macroalgal species was simultaneously studied in two biogeographic regions: the Caribbean and Hawaii. Herbivores suppressed growth of invasive algae in their native (Caribbean) and invaded range (Hawaii), but despite similar levels of herbivore biomass, the intensity of herbivory was lower in Hawaii. Algal species with a circumtropical distribution did not show a similar effect of herbivores on their growth. Nutrient enrichment did not enhance growth of any algal species in either region. The reduction in herbivore intensity experienced by invasive algae in Hawaii rather than an escape from (native) herbivores provided invasive macroalgae with “enemy release” sensu the Enemy Release Hypothesis (ERH). 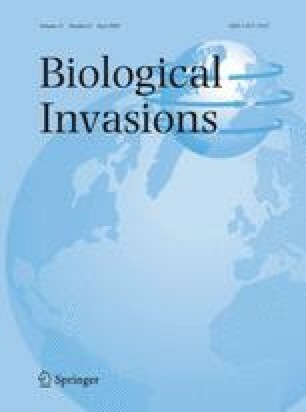 Since native, Hawaiian herbivores still feed and even prefer invasive algae over native species, invasion scenario’s that involve predation (e.g. the ERH) could be falsely dismissed when invasive species are only studied in their invasive range. We therefore argue that escape from herbivores (i.e. enemy release) can only effectively be determined with additional information on the intensity of predation experienced by an invasive species in its native range. The Hawaii Department of Aquatic Resources (DAR) is thanked for their help with permitting procedures. The CARMABI foundation is thanked for logistical support on Curaçao. Stuart Sandin is thanked for constructive criticism on earlier versions of this MS. This research was supported by a grant to CMS, number NA03NOS4780020, from the Center for Sponsored Coastal Ocean Research, National Ocean Service, NOAA. This is ECOHAB publication 293.